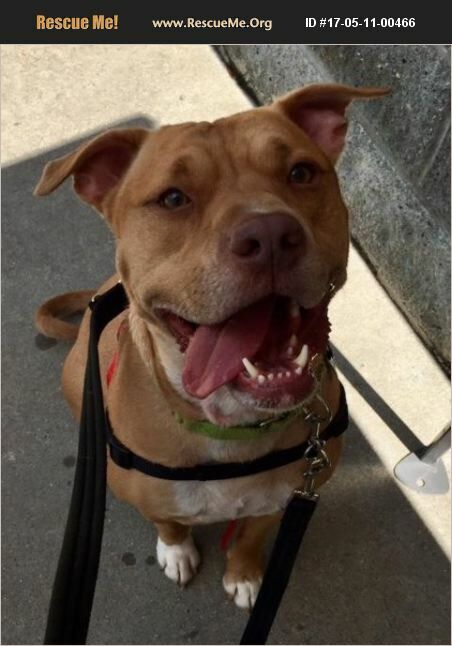 Rocky, Male, 4 years old, 58 pounds ROCKY IS BEING FOSTERED IN THE RICHMOND, VA AREA. IF YOU ARE INTERESTED IN ROCKY, PLEASE GO TO WWW.MOMSRESCUEVA.ORG AND COMPLETE AN APPLICATION. Meet Rocky! This handsome lab/bully mix was rescued from a small high-kill shelter in NC when he was dumped by his family as they moved out of town. This solid built love-bug lived with kids, ages toddler to teenager and another dog but wasn't given much exposure to any other dogs' especially small dogs or cats. Because of this, he would do best in a small dog/cat free home. He can be very active and bouncy at times so he may do best with older children who can handle this boy with the heart of a puppy! He can get along well with dogs his own size but isn't quite sure how to properly introduce himself. He needs a gentle yet confident, knowledgeable owner to help guide him on meets. He is easy to work with though because he wants to please you. This boy has a heart of gold, with a silly, engaging personality and the most expressive eyes that are sure to make you smile and melt your heart. He loves playing with toys, car rides, and just hanging out with you. He's housebroken, has pretty good house manners, and listens well to you. He is good on a leash, and loves to go for walks but could use some extra training. He loves head scratches, endless belly rubs, giving kisses and naps on top of the couch cushions. The key to unlocking this boy's great potential is exercise. He likes to do laps around the yard to show off his super speed! He must have a way to release his energy and once he does, he is happy and content and his personality really shines through. He is truly a great companion, he just needs someone to give him a chance to prove how wonderful he is! To find out if Rocky and you are a good match, please go to www.momsrescueva.org and complete an application.